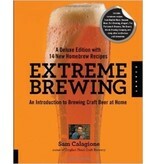 Sam Calagione's second book, Extreme Brewing, was first released in November 2006. This is the deluxe edition with 50 more pages and more than a dozen new recipes. The book is targeted to the thriving novice homebrew audience and features 224 pages, amazing photography and lots of recipes. 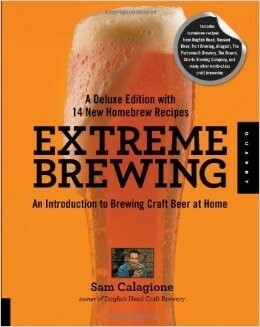 Aspiring brewers who are interested in recreating specialty beers -- but don't have the time to learn the in-depth science behind home-brewing -- are presented with a host of primarily malt-syrup based (the simplest brewing method) recipes, plus Calagione's detailed instructions for partial-grain brewing variations. While recipes are included for classic ales and lagers, Extreme Brewing emphasizes the hybrid styles that have helped put his Dogfish Head's beers on the map. Using fruit, vegetables, herbs and spices, readers can create their own unique flavor combinations for truly world-class beers.